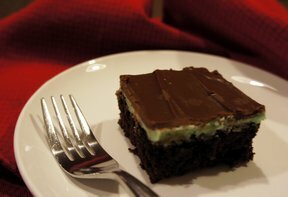 Fudgy brownies topped off with creamy mint and minted chocolate. Not only beautiful to look at but tastes great to. This is perfect for the holidays. Make brownies as directed on the box in 9x13" pan. Cool completely. For Filling, combine powdered sugar, butter, water, mint extract and green food coloring, if desired. Beat until creamy. Spread evenly over cooled brownies. Refrigerate until set. Or Topping, melt mint chocolate chips and butter in microwave. Spread over brownies. Chill before cutting. Store in refrigerator. 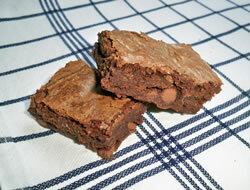 "I used dark chocolate brownie mix. Everyone else loved them but I thought it was a little too minty. Next time I will use regular chocolate chips instead of the mint ones for the topping to cut back on the mint."